Happy? None Of Your Business! This ISN’T a political blog. It really isn’t – I have to say that straight off before you read further. I am a dyed in the wool direct marketer, taught to measure everything, a firm believer in “what gets’ measured, gets improved”. This is so true in the world of social media activity and if anybody tells you that you cannot measure ROI of social media activity, punch them on the nose, or at the very least, show them the door. Social media activity can indeed be measured in terms of ROI, but the ‘I’ really needs to stand for involvement, rather than ‘investment’. But I heard the other week that the UK Government is to spend £2m on measuring the nations ‘happiness’. Apart from this being a dreadful waste of money at a time when cuts are being made into every area of public spending, I have to ask, just what business is it of a government, how happy I am? It’s none of their ******* business! I’m sorry, but this seems like the tentacles of government spreading further and further into our private lives. Now I ‘m a huge fan of Kevin Roberts, the charismatic CEO of Saatchi & Saatchi Worldwide and his blog post just reached my inbox, in which he supports this move. So I find myself at complete odds with Kevin for the first time. I sense my libertarian instincts suddenly being roused by this announcement. I’m sure I won’t be directly affected by it, and doubt I’d miss the effect on my taxes of the spending, but the principle that a government wants to find out how happy I am is ridiculous at best, sinister at worst. 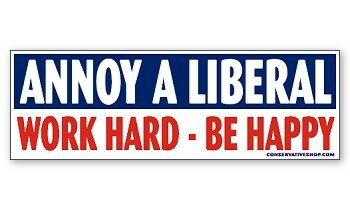 But I don’t want to annoy anyone, let alone a small ‘l’ liberal like me. Am I out of sync? Previous PostGroupon and Google – Maybe Not!Next PostNearly half of all Twitter users don’t read a word you say – that many?